It’s clear, watching even just the first few minutes of Broadway-bound Aladdin at the Ed Mirvish Theatre that the Disney production team is hoping for another Lion King. The Toronto production is busy shoehorning in extra performances to meet ticket demand, and taking out advertisements all over New York to trumpet the arrival. Unfortunately, unless there are some significant changes made, I cannot with any confidence predict Broadway success. To be sure, some things about the production are very good. Chief among them is James Monroe Iglehart who is ten kinds of fabulous, each with its own theme song. He plays Genie full-camp and full throttle. Iglehart is so relatable that we’re disappointed and delighted in turn when he is. Adam Jacobs as Aladdin has such a great, classic Broadway voice and does a pretty good job channeling a certain aw-shuckness that lets us like Aladdin. The costumes are great, and they seem endless – you might have thought that no scene on earth could require a single actor to wear four different colours of lamé harem pants, but you would be incorrect. They lend a sense of grandness to the proceedings that, frankly, it needs. Regrettably, that’s most of the good news. I am forced to conclude that the costume designer got most of the budget, because the scenery appears to have been constructed of cardboard . It wobbles worrisomely when Aladdin scampers among the minarets and I don’t even know what to tell you about those one-dimensional cutout palm trees. The rest of the money seems to have been blown on special effects, and I would dearly love it if someone would take it back. I emphatically did not want the ooh-wow magic carpet scene we got, in which Aladdin and Jasmine float through the air in a murky puddle of light, backs frequently to the audience, while a whizz-bang light show goes nuts around them. I understand that Broadway expects special effects, but I would have been much happier with the dancing flashlights and then planets, graceful and tasteful, plus a great big bright light on the central love theme of the whole entire show. I did not get my wish. Another wish I did not get: a Jasmine with any significant amount of appeal. I was pretty disappointed by Courtney Reed, who can certainly sing, but didn’t seem to have any of the jazz that Jacobs had as Aladdin. The chemistry between Iglehart and Jacobs was so good that it actually became the central relationship of the show, and Reed as Jasmine ended up feeling like a distant third-place – this role needs a rewrite so we can see some actual reasons why the two of them like each other, and then let them fall in love. In the original story, Jasmine is clever and kind. Here’s she’s just…cute. There were also some startlingly tone-deaf moments in the show: apparently if a woman of colour is curvy she has to be “sassy”, and among Jasmine’s handmaidens, the most voluptuous of them was given this sad racialized retread to drag across the stage. And watching the Genie, a black man, humbly dance about thanking Aladdin for his freedom while shouting “Free at last!” made a lot of the people sitting nearby look at one another with a “did they just make him say that?” look on our faces, me included. Director Casey Nicholaw would be well-advised to take advantage of his multicultural cast for their theatrical and musical talents, rather than their ability to serve tired racial tropes. 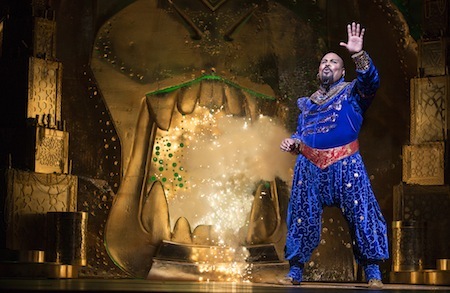 There are some things to like about Aladdin, and you can pretty much bank on loving every moment Iglehart is onstage. But overall, if this show has any life at all it’ll be parents taking children to see it, for however long that lasts. Probably long enough to get the props properly glued down, and perhaps long enough so that the dancers aren’t still murmuring instructions to each others. Maybe even long enough for the trio of Babkak, Omar & Kassim to convince someone to write them better material, more in line with their combined talents. It feels unlikely, at this moment, to last very long without some real changes before Broadway, though. Aladdin plays at the Ed Mirvish Theatre, 244 Victoria Street, until January 5. Showtime are Tuesday – Saturday 7:30pm, Wednesday, Saturday & Sunday 1:30pm, with quite a few weekday matinees added during the school holidays. Tickets can be purchased online through TicketKing, by phone at 416.872.1212 or at the Ed Mirvish Theatre box office.